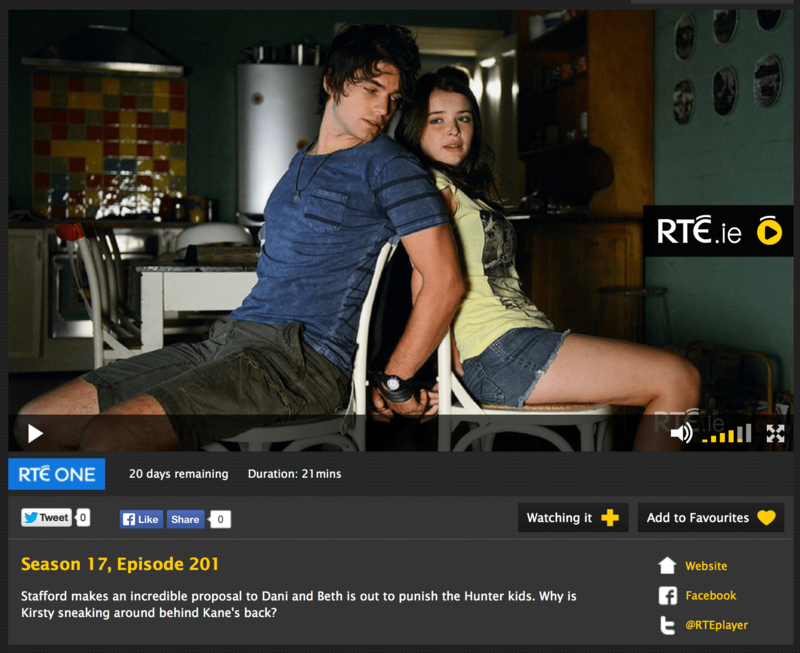 RTE player staff got a bit confused with Friday’s episode. This sounds like a plot from ten years ago. Cody and his toughs turned up to get some info on Andy’s whereabouts. First they put the hurt on Casey at the gym but all that succeeded in doing was dragging Brax away from the house to rescue his bro. Little did he know that this was what they wanted all along. As soon as he left Braxton Towers for the gym, they went over to capture Josh and Evelyn, who they took to the farm for kidnap and interrogation. Kyle is going to be annoyed when he finds out, some kidnapping in the Bay that he wasn’t involved in. Where was Kyle anyway? The lads forced Josh to leave a message for Andy, telling him to come and rescue them. Will the selfish mongrel turn up? What if Oscar and Hannah show up first? John got a surprise when Shandi turned up in the diner. They had a chat on the beach and seemed to have straightened things out a bit. Everything was going fine until he told her about Jett; she lost the plot when she heard he had a foster son. Things will be a bit bumpy for a while but she’ll be grand once she acclimatises to the Bayside way of life. Casey felt sorry for Andy because he’s homeless and keeps making mistakes. He found him sleeping in the gym. He is going to lend money to him to get him off the hook with the drug dealers as he doesn’t want Josh getting bashed again, I reckon. Denny and Casey had a romantic meal but had a bit of a row when he stood up for Andy Barrett while Denny thinks he’s nothing but trouble. Alf told her to talk to Casey and sort things out. Leah is worried about Nate and told Sophie to stop leaning on him so heavily. Sophie pushed back and told her to mind her own business. That wasn’t enough though, she wants to move out and doesn’t feel happy living under the same roof as Leah. She seems to have Nate wrapped around her little finger. He went to the school and told her to mind her stay out of their marriage. Served. Roo is still pressurising Marilyn over the wedding but they managed to sort it out and she asked Roo to be her bridesmaid. Hopefully that will be the end of the wedding hassling storyline for a while. Brax and Ricky are going to try for a baby and got hot and steamy in the shower. Given the summer bay time warp, she’s probably pregnant by now and will be in labour by the end of the month. Hannah is pretty slow on the uptake. She confronted Zac about the drugs at the farm and finally figured out that she was led up the garden path by Andy, he was to blame for the dope. Josh confronted his bro on the beach and gave him grief over his bashing. No doubt he’ll give him another chance, he always does. Maybe Hannah will give him another chance too, she usually does. Meanwhile Zac has moved out of the farm, he’s sick of Hannah and her ways. Roo is trying to organise Marilyn’s wedding and going overboard. Poor Marilyn is getting stressed even though the wedding is months away. She even went to John to try and recruit his help, even though the two of them want a simple beach wedding. Maddy and Spencer went for a game of pool while she tried to get in contact with Josh but there was no answer from him. Maddy has copped on that there is something up with her fella, that relationship won’t last too long in my opinion. She went to the farm to find him hanging out with Evelyn. She asked them what was happening between them but didn’t get any straight answers and stormed off. Phoebe wants to get a flat for herself and Kyle. She arranged it by getting Matt to pretend to be a reference, she didn’t want to have to rely on a Brax reference. Then she met the landlord on the sly without telling Kyle. He put 2+2 together when he saw them and thinks something is going on. Things will get worse when he finds out that she robbed money from the till for the deposit. Josh has realised his relationship with Maddy is going nowhere, he must be sick of the moaning, which will be twice as bad now she has to to repeat the year in school. He met her on the pier to give her the heave-ho but before he could get the words out she was telling him that she is going to change and she needs him. He’ll have to put up with her for now so. Alf and Roo had World War 3 in the kitchen while John, Marilyn and Jett tried to stay out of the way. Alf wasn’t impressed with her going to South America without telling him but she still hasn’t explained why she went there. Mysterious. We had a strange experience watching todays episode on the RTE player. After a few minutes the picture went and we were left listening to it. It was like listening to the Archers on BBC radio 4. Matt doesn’t want to be school captain with Sasha, he feels their relationship would suffer. Sash doesn’t agree and crowned him King of the idiots. Will he be more Solomon or Henry VIII? Leah tried to talk Matt into doing it with Sasha, he reckons she’s just being nosy, but she managed to talk him around. Matt and Sasha are going to become joint captains. Darcy fancies Jett but he’s not interested which upset her, he friend zoned but she was hoping for more, the age gap was too severe according to him. Heath tried to get to the bottom of it with Jett but just ended up embarrassing Darcy. Heath is struggling with raising Harley on his own. He almost starved to death with all of the baby chores and had to go to the Diner and order two burgers. Hungry Heath. He then left the baby with John and Marilyn while he headed off. They had a great time minding the baby, I thought Marilyn was going to suggest they have a child of their own. Dr. Accent wants to get back together with Sophie, Leah doesn’t approve. Maybe there could be a future love interest between them? Do babies need hats in Austrailia? Looked pretty hot there today. Chris needs to work on his business sense. He accepted a scratch card from a customer in place of cash, Irene thinks he may have well asked for magic beans. He apologized to Irene and she gave him the scratch card back. He won a cruise but gave it to Irene. Casey is worried about being home on his own after the drive by, he told all to Denny in the diner. Chris is still a bit paranoid about Denny being mates with Casey so that was why he wouldn’t go on the cruise. He’s going to have a free gaff at Irene’s place but will have to work extra shifts at the diner due to his boss’s holiday. As a result, Denny called over to keep Casey company with pizza in hand. Does anybody in that town ever get sick of pizza? He gave her the eye, definitely something cooking between them. Jett can’t afford to pay Denny for her work on the boat due to his pay dispute with John. Luckily for him Alf was on hand to offer him a job in the bait shop. He’ll soon be a salty sea dog like Denny and Alf. Marilyn got John & Jett to sit down and discuss their issues with pay, she’d make a good shop steward. Sasha is annoyed with Matt and they had a row in the diner about who did and didn’t get it. He told her that her face is a complete tool, which didn’t go down well. He stripped off on the beach in front of the whole town, which worked as an apology somehow. Phoebe’s Dad returned full of apologies for Kyle and Brax. Can a leopard change his spots? I doubt it. Casey is doing it tough because Tamara is gone, Kyle didn’t seem to notice her departure. Denny wanted to help cheer him up but Chris is still a bit insecure about his girlfriend’s friendship with Casey, in the long run I think he might be right. Andy is causing hassle left right and centre. He tried to start a row with Brax on the beach and then in Angelo’s. Why is he so aggro? John wants Marilyn to help him with Jett so she gave him a tough punishment. He’s annoyed with her now but the kid needs to learn, he can’t keep hooning around like a little larrikin. Brax and Ricky survived an assassination attempt when somebody shot in the window of their gaff. Who’s behind it? Andy is too thick to use a firearm so maybe it was somebody hired by Phoebe’s father? Phoebe’s dad is a big city lawyer and he decided to take a trip to the Bay to check up on his daughter. He wants to see how she’s getting on with her fella, given that he’s supporting her financially. He is very curious about Kyle and seemed none too impressed when he learned that he’s a Braxton. He is getting a detective to investigate Kyle, I’d say he’ll find some dirt there. Bianca was upset to find Heath returned bringing Harley, unexpectedly. She is trying to adapt to their changing circumstances. He accused her of being selfish and not thinking about him and the baby. She still thinks he needs to decide between Harley and her. Leah reckons they’ll find a way through their difficulties as they love each other. They had a showdown on street and she told him it’s over, she can’t get over Harley. Bianca went crying to Irene and Heath was left holding the baby. John is missing Jett and Marilyn is having a hard time cheering him up. She suggested a tarot reading or tea leaves to see what’s going on for him, they settled on a palm reading and they had a discussion about John’s wedding ring. He said he’s not ready to take it off yet and Marilyn is fine with that.